Housing at UCI is plentiful, but the options can be intimidating. In this post, I will be going over the pros and cons of each popular housing option! No, freshmen are not required to live on-campus, but 81% of freshmen choose to do so. Living in the residential halls was one of the best experiences I’ve had - so great, that I decided to return to the community as an RA my third and fourth years! There are two freshmen housing communities, and the question I hear most as a tour guide and RA is “between me and you, which one is better?” To this, I counter - it depends what you’re looking for. Both communities are equally great places to live! Names: Spanish outdoors themed. The history of MC is that they named the original halls after what you could see out your window: “Playa,” (Beach) “Camino,”(Path) and “Ciudad”(City) are some examples. Food: Anteatery (All-you-can-eat dining commons accessed by your ID card - freshmen living in the dorms must purchase a meal plan. The meal plan options are 100 swipes/quarter, 5 day all-access (good if you go home every weekend/you want to cook), and 7 day all-access (my absolute favorite). Choose wisely). Themed halls: each hall is themed to allow each student to live to their fullest potential. Are you a dance major (or someone who likes to dance)? There’s performing arts halls for that, that are equipped with pianos and full mirrors in the living spaces. There are biological science halls for biology majors who want to study together,, half-international student halls (MC-GLOBE) for those interested about creating international friendships, and general interest halls for those who can’t make up their minds. (Disclaimer: you don’t have to be a bio major to be in a bio hall, or arts major to be in a performing arts hall - we will take all your preferences into consideration regardless of major). Location: Across the bridge from the Student Center and School of Humanities, adjacent to the Claire Trevor School of the Arts. Living in MC for two years, my biggest advice is to make sure that you DO NOT CHOOSE THE TOWERS if you do not think you can live with three other people. Period. Just because it is new, does not mean that it is the best place to live. I have lived in the bigger classic halls in MC that hold 90 people (Lluvia ‘15-’16, General Interest) and smaller classic halls in MC (Viento ‘17-’18, MC-The Globe). Both have been incredible experiences in their own unique way - I loved living in a huge general interest hall, surrounded by so many people, but I also loved the intimacy and history of my smaller classic hall. Each of these classic Mesa halls only have single, double, or triple occupancy - so if you’re thinking about choosing the Mesa Court Towers as your housing preference (yes, we do take preferences for housing, as well as roommate preferences), please make sure that you are making the best decision for you, and not just based on outdoor looks! The American Campus Communities (ACC) provides on-campus guaranteed housing for those trying to take advantage of hassle-free living! Again, it is not required to live here your second year (or choose to renew your third or fourth year), but many choose to live in the ACC apartments, which are FULLY FURNISHED and encompasses several housing communities. 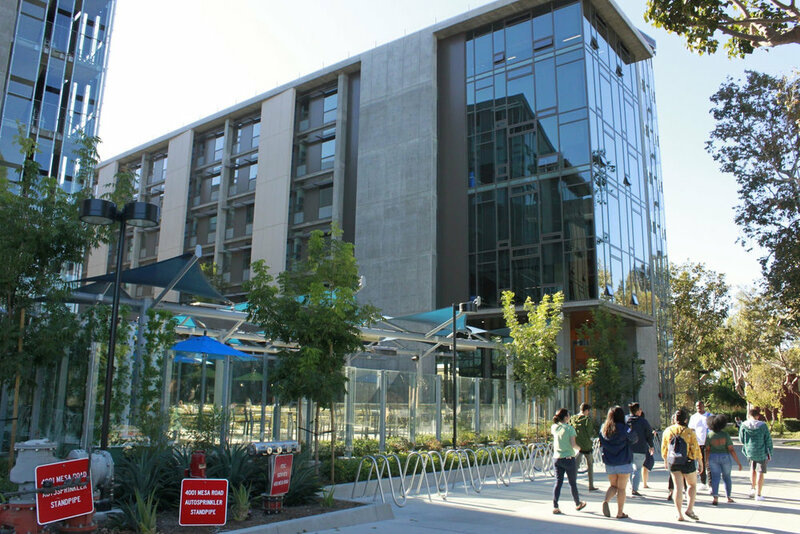 People choose to live in ACC apartments because they all have air conditioning, are fully furnished with installed cable and internet, and if you don’t already have a roommate, they will be able to put you in apartments with other UCI students. ACC apartments are hassle-free! Pros: Super close to humanities, biology, and physical sciences areas of school (shout out to 5 minute walks to MSTB! ), 24/7 study spaces, relatively cheaper than any other on-campus living, quiet and peaceful. Pros: Even though it’s “off-campus,” it’s a lot closer than the ACC apartments, next to University Town Center for easy access to shopping, food, and Trader Joe’s, 2 free parking spots, slightly cheaper than ACC apartments ($600-$800 for a double), access to all UTC amenities (pools, jacuzzis, gyms). If you have a car or a bike, living off-campus may be a much cheaper option. The perks of living in such a planned city next to the beach means there are plenty of housing options, and many people choose to live on the beach when they can! All in all, there are plenty of housing options available in Irvine, and I hope this helps in deciding which housing community fits your lifestyle the best! Freshman housing tours are available in the spring for Mesa Court and Middle Earth - who knows, I might be the one taking you around!